This book presents a provocative perspective on the impact of the Reagan administration. Many political commentators, both liberal and conservative, argue that the 1980s was a period of fundamental conservative change. Some of them believe the changes have been so important that the 1980s should be seen as a watershed period in American political history as significant as the 1930s. Schwab denies this thesis and points out that politics and policy did not fundamentally change in a conservative direction. Instead, he demonstrates how policy developments and the political system actually moved in the opposite direction. In the realm of public opinion, Schwab points out that sentiment tends to shift toward the left rather than the right. Support for social and environmental programs remained high and even increased during the Reagan era, whereas support for defense programs dropped to a near-record low. Instead of a New Right conservative shift in public opinion on social issues, Americans became more liberal on women's rights, minority rights, and sexual behavior issues. 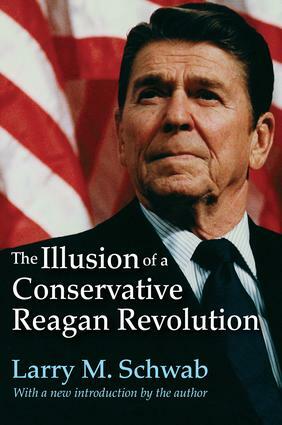 Schwab's critique extends as well to Reagan's political success and popularity. Rather than being one of the most successful presidents in leading Congress, he was one of the least successful. His conservative ideology lessened support for him among many voters and congressional liberals gained more voter support during the 1980s' elections than conservatives.